The outrage mob never sleeps. Australian newspaper cartoonist Mark Knight came up with this after that embarrassing episode at the weekend. It’s resulted in Knight receiving death threats after the usual suspects declared it racist. Quite what’s racist about it I can’t see, but then if I ever understood where these people are coming from I’d start to worry. To his credit, he (and the Herald Sun paper) have refused to back down to these morons. So that’s where we are. Three years after muslims murdered journalists and cartoonists at Charlie Hebdo, the extreme Left nudges thinks that’s a good tactic. Professional blacks and loony leftists want to live in a cold, silent world where no-one risks being caricatured. Fine, they can have that world and normal people can live in our normal world. They ought to be mocked at derided until they keep only among themselves. Well said Pete. The victim mentality insists on the right to take offence where none is intended. Because Williams’ ancestors were slaves she is excused her vicious rant and the umpire (by implication) stands accused of white male privelege. I suspect that his career is over. It is a cartoon and to my eye not a racist caricature. Williams behavior at the event was deporable. If I were the umpire I’d consider lawyering up. 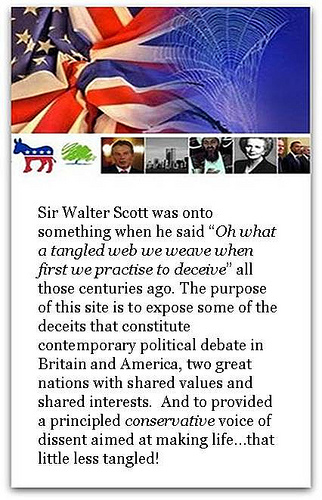 Williams impugned his integrity and professional reputation. It’s a very mildly amusing caricature drawing of an over indulged sportswoman who had a diva moment. If anyone’s going to get offended it should be at the vacuousness of the celebrity culture it displays. I don’t really know anything about what Williams did to provoke this reaction. I know she has a fiery temper. But you should no my opinion by now on any form of censorship. And that cartoon certainly doesn’t look racist in any way to me. If I were the umpire I’d consider lawyering up. That would be David taking on Goliath (I hope that’s not sexist or racist or transphobic). He would be hit with a massive counter-suit for misogony, racism, vile prejudice, character assassination, loss of earnings, loss of endorsements, hurt feelings, support for slavery, yada yada yada. 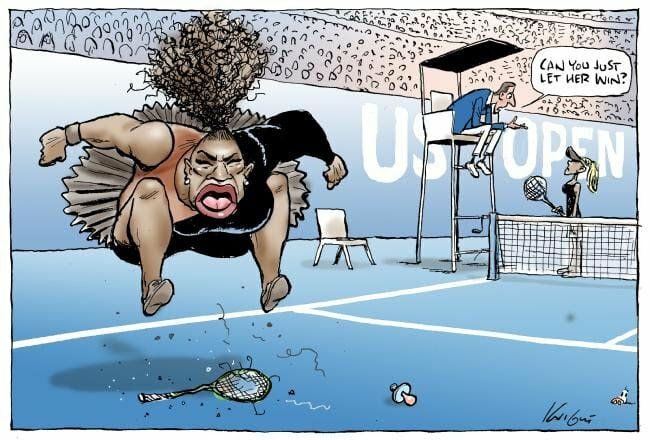 What makes this cartoon non-racist is the dummy/pacifier spat out and lying at the side of Williams’s broken racket. It’s a brilliant piece of humour based on the reality of Williams just having ‘lost it’, and this seems to happen frequently. Wimmin are calling the cartoon sexist too – so here is one about somebody we all remember……imagine that the subject had been a black female? Both the umpire and cartoonist need immdeiate lawyering-up. From what I’m reading, there is mobilisation against them both, and their means of making a living is targetted. Christ, talk about being easily amused. Stop being anti – Semitic Peter. Sorry Paul, I missed that one. If any “lawyering up” by the cartoonist or the umpire becomes necessary to defend themselves, my guess is that they could crowd-fund sufficient millions to match the multi-millionaire who would be stupidly and vindictively pursuing them. The one surprising thing so far has been the absence of a Tweet from you-know-who, given his onslaught against Nike last week. It’s a tough one to call whose side he’s on, but I’ll hazard a wild guess that it’s not Serena’s. Slightly OT but here’s an interesting item from Washington State which reveals differences between the races……..
Police in Washington state searching for two males caught on camera ignoring a store clerk who collapsed in front of them from an apparent medical issue, choosing instead to step around him to rob the store. Obviously, the ‘males’ are black as ABC omits. The shopkeeper had a heart-attack and collapsed and so, instead of the natural whitey reaction of helping the shopkeeper, the blacks robbed the store. Is it ’cause she’s black? This one’s for you Allan. I was very critical of Serena Williams’ behaviour at the US Open, and I still am. However I am also very uncomfortable with this cartoon. Drawing people of African descent with comically oversized lips and mouths has long been a racist trope, similar to drawing Jewish people as sinister with oversized hooked noses. Williams’ behaviour was appauling. But this is a racist cartoon in its use of outdated tropes about the features of African people. Her mouth and lips are damn near the same size as her entire head. It’s the sort of Jim Crow like cartoons you would have seen in the American South in times gone by. Why do you think Pete & Allan like it so much Seamus? But there could be blowback…..
Carlos Ramos – is that not hispanic, and is there not a ‘hispanic card’ that could be played here? However I am also very uncomfortable with this cartoon. Drawing people of African descent with comically oversized lips and mouths has long been a racist trope, similar to drawing Jewish people as sinister with oversized hooked noses. Here’s a caricature of George W Bush, likening him to a chimp…….. Yes it is a caricature. A racist caricature. Are you seriously saying that doesn’t remind you of the sambo and gollywog cartoons? There are ways of drawing people without doing so in a racist manner. Drawing black people with ludicrous mouths or noses is a long standing racist practice. If he had drawn her without those things he would have still made his point but would have done so without being a racist. So is it racist to draw Theresa May and Margaret Thatcher as per my 11.30? Or does their “white privelege” make that impossible? What disturbs me is that racism is now seen everywhere. The only safe thing for the cartoonist would have been to stay away from this story, and the uproar will make that more likely in the future. The next time that Serena loses it there will be no reprimand from the umpire and no cartoons, and the woke bullies will have won another victory against free speech. It isn’t racist to draw May and Thatcher like that because I can’t recall anti-white racist publications who repeatedly drew all white people in that manner. Criticising Serena Williams is not racist. Drawing her in a racist manner is racist. Well Seamus, it is obviously all in the mind. If you want to see racism everywhere you will see it everywhere, whether it was intended or not. It is enough if it “gives offence” and causes distress. What we obviously need is a censor who will judge what is a racist cartoon and what is not, and it might be a fine line. So most artists will self-censor in response to the chill factor. And we will all be a little less free because the boundaries of what is “acceptable” will have been further narrowed. But you will be cool with that, and anyone who is not will be either a racist or a fellow-traveller. No? I dont want to see racism everywhere but I see it when I see it. Would it be acceptable to you for someone to draw a Jewish person with a giant, hooked nose? Hell maybe preying on a little blond woman just for good measure. Would that be acceptable? Or would that be me seeing racism because I want to? The narrative of Williams being put upon (by alleged sexism or alleged racism) instead of her appalling celebrity behavior is what is intended by criticism of this remote cartoonist. It is a cartoon. It was not a random attack on Williams but was published after her childish on Court tantrum. I genuinely didn’t think this was a racist representation of Serena Williams. To me it just looks like a caricature of a black woman, shouting and jumping up and down. Seamus could have a point. I suppose it’s how you interpret these things. Seamus – the caricature was recognisably of Serena Williams. It wasn’t a cartoon of any African woman but it was recognisably of Serena Williams. Does anybody not recognise the cartoon as being of Serena Williams? We are removing the idea of intent from racism and replacing it with how it is received, not a wise move. If the subject proclaims the umpire is sexist then he must be. If the subject proclaims the cartoonist racist he must be. While there is objectively such a thing as a racist cartoon I don’t see the intent here. The question is how it would be received by a neutral outsider, irrespective of the intent or the artist or the sensitivities of the Williams camp. If, say, the cartoon drew on racial stereotypes (e.g. big lips) that this individual did not have, then it would be racist. As far as I’m concerned, the real photos of this woman last week were more caricature than any cartoon. You are probably right Noel.